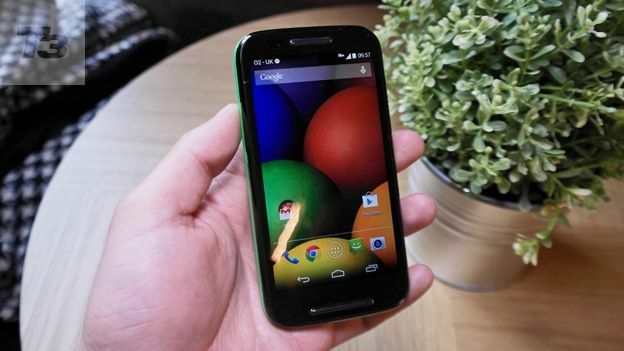 If you thought the Motorola Moto G was good value, you'll love its successor, the Motorola Moto E. Its another stripped back, no frills Android-running smartie, but here's the kicker: it comes in under a ton. Just £90, to be exact. That's on a par with the Nokia Lumia 630. Is it the best budget blower in town? Or now that the Moto G has been refreshed with 4G and a microSD card slot (and a slightly higher asking price of £149), is it a better bet? Let's find out. The first thing you notice when picking up the Motorola Moto E is it weighs a fair bit. It tips the scale at 142g – that's only 1g lighter than the Moto G, and 8g heavier than the Nokia Lumia 630, both of which are slightly bigger than the Motorola Moto E.
The back is a right pain to prise off. We wouldn't advise doing so too often if you want to keep your fingernails. It features the same dimple as the Moto G, which makes it comfortable to hold. Its matte finish is nowhere near as smooth as the iPhone 5C, but then this handset is a fraction of the price. The back is interchangeable, and comes in black, white, violet, spearmint, raspberry, royal blue, turquoise, lemon lime, and cherry colours. At time of writing, they're listed as coming soon on the UK site, while in the US they cost $14.99 each. Unlike the original Motorola Moto G, the Motorola Moto E has a microSD card slot for adding 32GB of storage to the internal 4GB. It runs Android 4.4 KitKat, which is the latest version of Google's OS. Because it's pure Android, it should be one of the first in line for new software updates. There's no 4G, but you do get Bluetooth 4.0 and a 3.5mm headphone socket. Did we mention it costs £90 as well? The 4.3-inch screen has a resolution of 960x540, which gives it a pixel per inch count of 256ppi. That's not going to win any awards, and as you can see in our photos, it's a little grainy. It's nowhere near as bright and sharp as high-end handsets. But it's fine for basic tasks. On imaging duties are a 5-megapixel camera that captures video in 720p resolution. There's no front-facer, so you can forget about video calls. The camera is fine, but the shutter's a bit slow, you lose a fair bit of detail in low light, and there's no flash. It's OK for throwaway shots, but it's not going to replace your compact snapper anytime soon. Inside is a 1.2GHz Qualcomm Snapdragon 200 chip. This is a low-end processor, so it's no surprise that the Motorola Moto E struggles with more demanding games, when the action becomes more frenzied. For the most part, video runs fine, though it's not the best screen for showing off luscious HD footage. Games are only going to become more graphically advanced, so if you're into your mobile gaming, this isn't the handset for you. For day to day use, the processor is absolutely fine though. It whips through menus fast as you like, while apps are pretty quick to start. It makes you wonder how much grunt we really need in our phones. Motorola claims you'll get 24 hours of mixed usage out of the 1,980mAh lithium-ion battery. While we got a full day out of it with fairly heavy usage, we found the Moto G lasted quite a bit into the next day too. There are compromises, sure. The camera's not great, the processor lags behind others, and there are much better screens around. But this is a well built, reliable mobile that comes with the latest software. And for £90, that's very tough to beat.